50 lively and engaging stories from around the world explore a broad range of life lessons. Includes reflection questions, story maps, and an index of themes and UU Principles. Spiral bound edition. Folktales—a font of timeless wisdom—are meant to be told aloud. This rich collection curates fifty such tales and provides guidance for telling them well in gatherings. These lively and engaging stories from around the world star a panoply of colorful characters. Their adventures and conundrums illustrate our relationships to the natural world and to one another and present a rich array of principles to live by. The stories explore a broad range of themes, including authenticity, forgiveness, generosity, death, faith, hope, and many more. Some funny, others poignant—all of the tales draw listeners in and allow them to develop their own personal interpretation. Each story is accompanied by a brief description to help users select one suitable for their occasion and reflective questions to provide food for thought or spark a conversation. Story maps help tellers quickly learn the tales and facilitate powerful oral storytelling. A comprehensive index of themes and Unitarian Universalist Principles rounds out this comprehensive folktale resource. Sister Goose swam in the pond, happy as could be. Now and then, she ducked her head down to nibble a little bit here, and nibble a little bit there. She took no more than her fill of those succulent underwater plants, for she knew that the pond belonged to everyone. Meanwhile, Brother Fox was hiding in the willows at the far end of the pond. He didn’t like to see anyone happy, least of all a goose. Brother Fox didn’t seem to hear her. He carried on, “You’ve been eating some of the plants in this pond. They don’t belong to you! If you don’t get out of this lake, I’m going to take you to court!” . . . When, in your experience, has justice seemed impossible? Who are today’s foxes? Who are today’s geese? What examples do you know of the “geese” winning? Sister Goose is swimming and dining in the lake. Brother Fox demands that she leave because the public lake is his property. Sister Goose refuses to leave. An argument ensues between Sister Goose and Brother Fox. They agree to settle in court. Sister Goose is found guilty and eaten. I often get just a few minutes' warning: "The guest minister didn't prepare a Message for the Children. Have you got one?" Faye Mogensen's collection of short wisdom tales, indexed for fast finding and "mapped" for speedy review, is just what I need! She has retold these traditional tales in her own fresh words. The smooth confidence of the telling suggests that these retellings are field-tested. Her experience with kids shows in the suggestions for listener participation. But the questions also include many that would challenge an adult RE group. I can heartily recommend this book to UU congregations and UU storytellers. 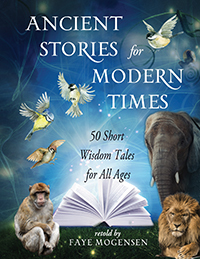 Designed for the novice storyteller as well as the seasoned professional, Ancient Stories for Modern Times reminds us that stories are both medicine and nourishment. They are gifts we give each other. Skillfully retold, these wisdom tales address an array of critical issues, from “Living with One Another” to “Seeking Justice” and “Accepting Change.” With Mogensen’s guidance, you’ll soon find yourself telling your own versions, trusting the story to come alive in your imagination. All you have to do is let one of the stories choose you and then begin. . . .
As someone who loves to tell stories, I already envision myself sharing these with audiences young and old. Those looking for stories for worship or workshops will be pleased by the wide selection, categorized by themes and including story maps to make the telling easier. The majority of these tales are new to me. I imagine Mogensen traveling down many paths—in forest and field, desert and plains of ice—gathering stories like precious jewels in a small sack close to her heart. Faye Mogensen has carefully selected stories with good bones, ready to be adapted and fleshed out by tellers of any experience level. She has gathered tales from all over the globe that cover a broad range of themes and offer deep but simple wisdom. This collection is sure to have something for everyone. I’ve picked out several new favorites already. Faye Mogensen has lovingly stitched together a wonderful collection of tales—and so much of this work sparkles! These stories are drawn from more than 30 countries and cultures, from first people creation myths to modern times and across a wide spectrum of religious beliefs. . . . Either buy this book as a gift for yourself or for a storyteller that you want to treat—they will thank you for it!